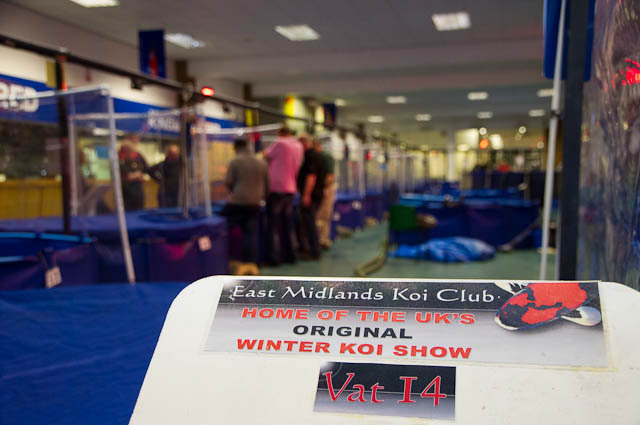 The East Midlands Koi Club (EMKC) put on their 3rd winter show which is now one of the main stays on the koi calender. 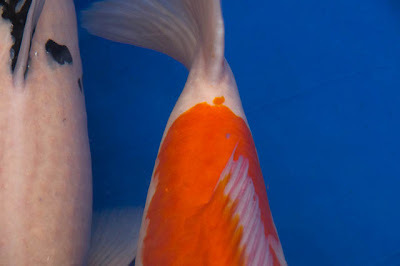 Several members wanted to visit the show so we coordinated to visit on the Sunday and share lifts to make it easier and cheaper for members to attend. 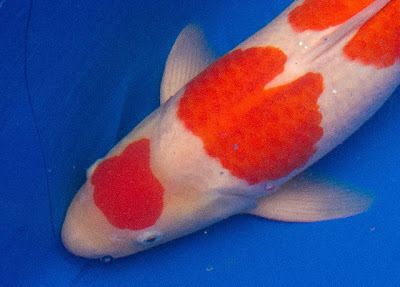 A koi show is basically where hobbyists bring their koi to the event and exhibit them in a vat. 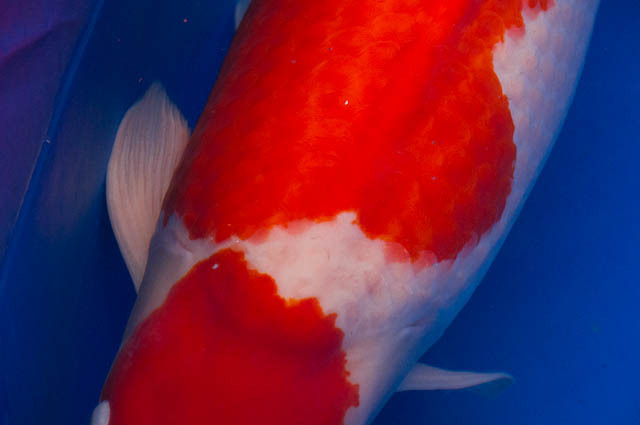 The English style of show is for each vat to hold only one person's koi. 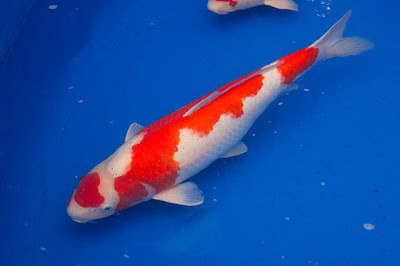 The koi are categorised by size and variety and when that's done, qualified judges spend a day doing the judging and assign prizes to koi and owners' dreams are made and broken. 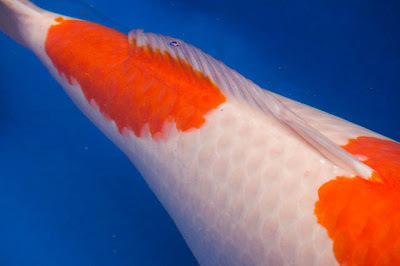 Some prizes are not selected by the judges, such as friendship awards and the jumbo award. This was our second club excursion this year, and here is a brief recollection of the weekend and the members' trip. We had one member (Adam Byer) exhibiting and here are some pics of his fish being benched. The "benching" happens when exhibitors bring their koi to the show and it involves going through each one and checking the koi's health and categorising it into a variety and size. It takes a lot of effort to put on a show, and lots of volunteers. 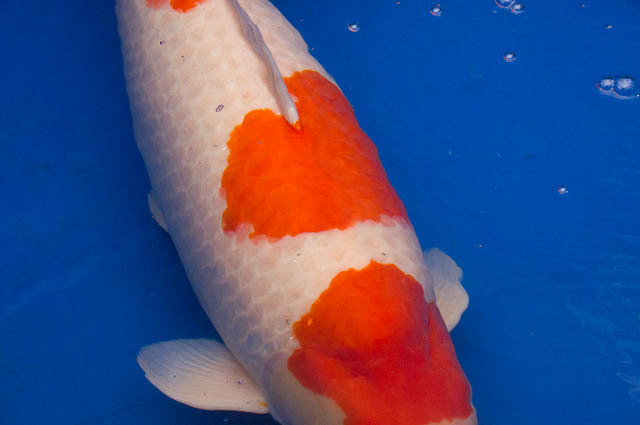 They have to cover everything from looking after the welfare of the koi to running the event itself. It takes judges to allocate prizes, and here are a few pics of some of the judges (and trainee judge, Jamie) in action. 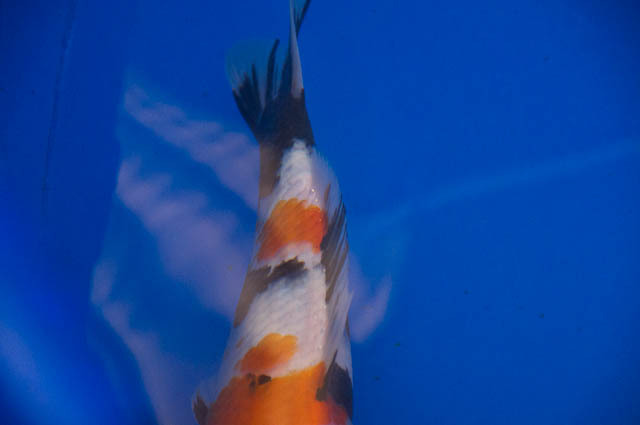 There are lots of prizes on offer at koi shows, and at the EMKC Winter show the prizes included each size and variety combo, each variety, each size also some "overall" champion prizes. 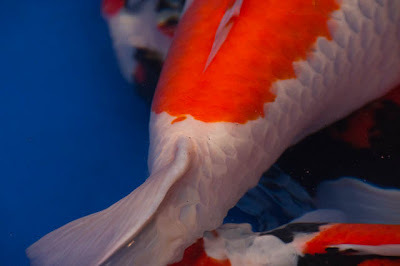 Our congratulations to all the exhibitors for putting on a fantastic display of koi for the public to enjoy. 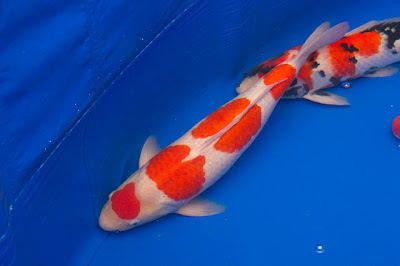 The competition was tough and here are the koi that won the overall champion prizes. 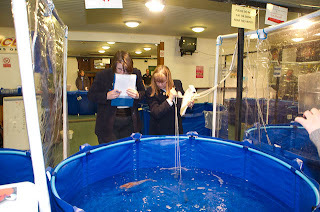 There are several prizes the judges do not allocate, for example, friendship awards and the Jumbo champion. This prize is allocated by the benching team to the longest koi in the show. 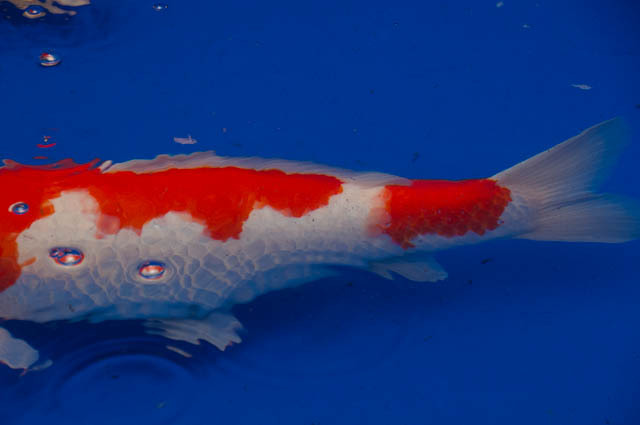 In this case, a 96cm Ogon (single coloured metallic koi). The owner told me it was first purchased from a garden centre as a tiddler... One thing is clear, it must be a good eater! EMKC held the show at Uttoxeter racecourse which is well set up for holding this kind of event. Easy to get to and park at. And warm! Which is important in the winter months... The show was held in the conference rooms that lie within the main stadium. Here are some general pics from around the show. 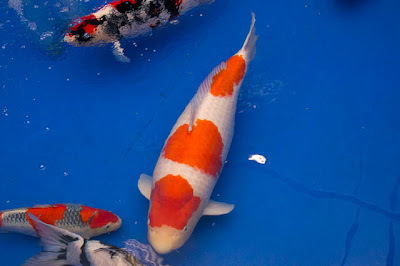 My highlight, and a fantastic experience for Kangei members - Gary Pritchard took us on a tour of the vats sharing his experience and insight into koi appreciation and the hobby in general. 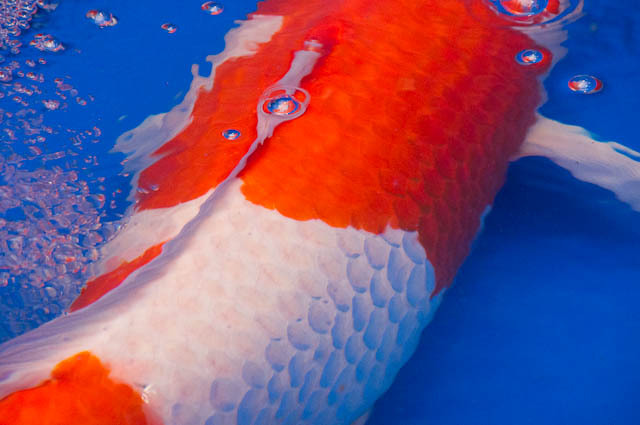 Gary is a big name in the koi world being a national and international koi judge and chair of the Judging Standards Committee (JSC) here in the UK. 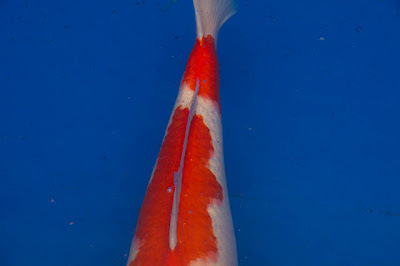 We all enjoyed the tour and some of the audio and video we recorded will be played exclusively at Kangei Koi Club meetings to share with members that couldn't make the trip. Thank you Gary. We are privileged to have you as a member of our club. After the public have left, it's down to the volunteers to dismantle the show. 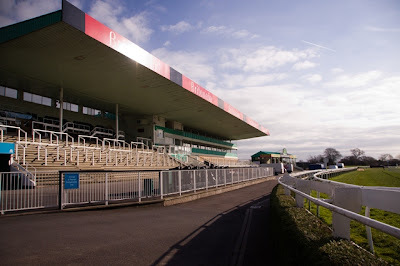 After a long weekend they are really showing their commitment to the club - it's the dedication of these volunteers doing this job and the many other tasks that happen behind the scenes that helps make the winter show a great success. Koi shows are an important part of the hobby. The competitive aspect gives koi breeders a reason to breed better fish and reap the reputation boost when their fish win the big awards, and it's also a meeting place hobbyists to enjoy some of the best quality koi in the country. 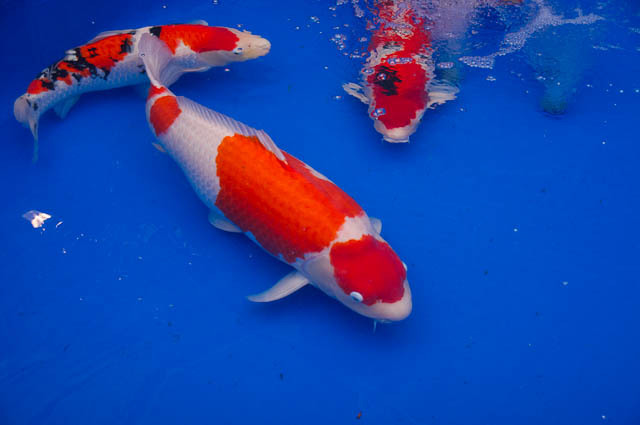 The winter show is perfectly timed because it wets our appetites for the forthcoming koi season and gives us something koi orientated to do in those dark winter months. "The atmosphere was friendly and relaxed, even though space was quite crowded around the vats at times." "I was lucky enough to hear Gary's vat tour at last year’s show, but still found it interesting and learned even more. Definitely a very big bonus of being a club member!" 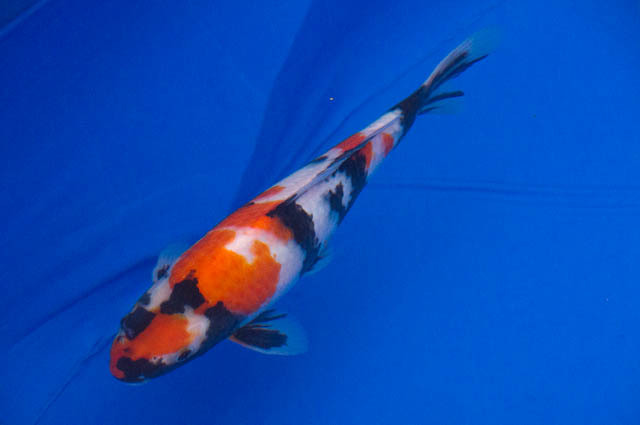 "Despite what is posted on the various forums by the constant knockers, there is still a great number of people who really love this hobby!" 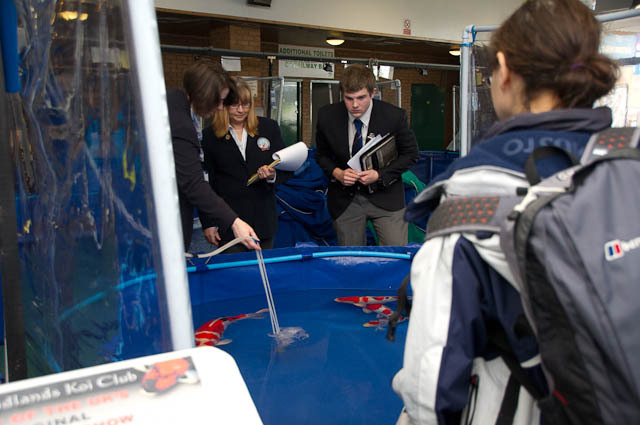 "Although there’s always a familiar face to say hello to at most shows, it’s great to have your own club mates to chat to and share opinions." 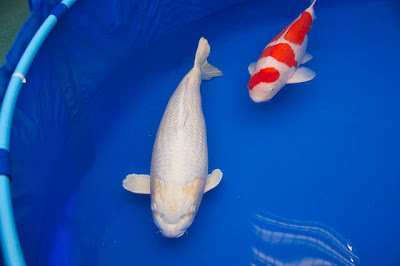 "When I was on my way home I was thinking about the EMKC. How many members have they got? When did they start? 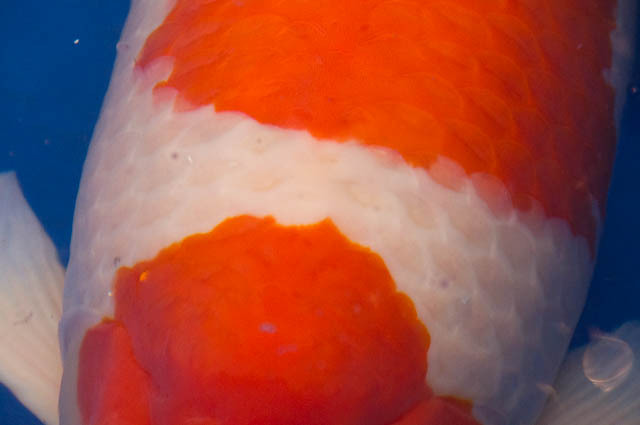 Where have they come from and how long has the journey taken? What makes their members so keen and enthusiastic? 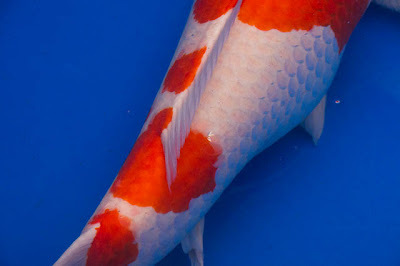 How can we make Kangei as successful as they are?" 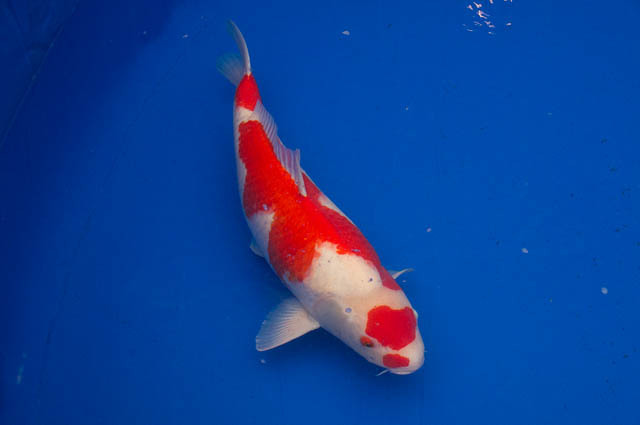 "The best thing about the show for me was seeing the amazing large colourful blemish free koi"
"Gary's tour was brilliant. He obviously has so much knowledge on koi appreciation. It was a privilege to be able to ask an experience koi judge questions about different aspects of koi appreciation, from body shape, skin and much more!" 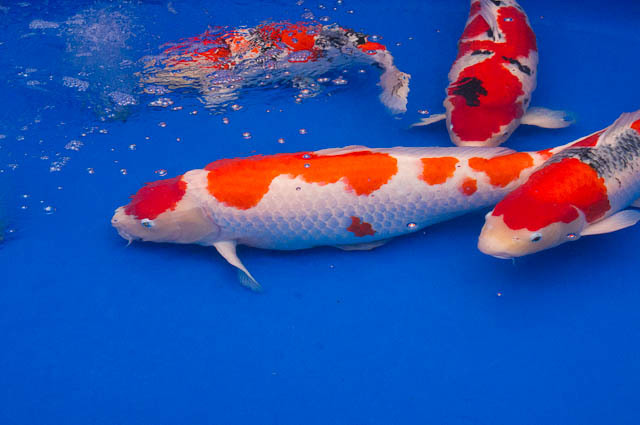 "Having shown koi now a number of times we are getting to know the wider koi community and I enjoyed catching up with them at the show." "It was great doing the tour with the club members, especially as I hadn't met most of them prior to the show. Everyone welcomed me as if they knew me well. I got a really lovely welcome and I felt part of the club immediately." 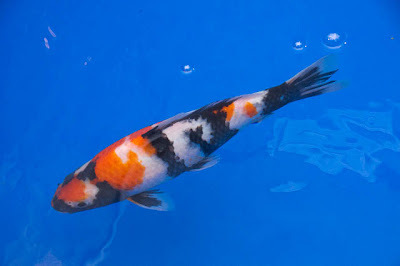 "I went home with our show fish on my mind when we were leaving as all I wanted to do was get them home safely." 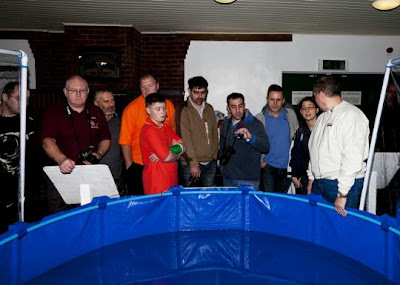 Thank you EMKC for putting on a great show, and thanks again to Gary Pritchard who has been so supportive of our new and emerging club. 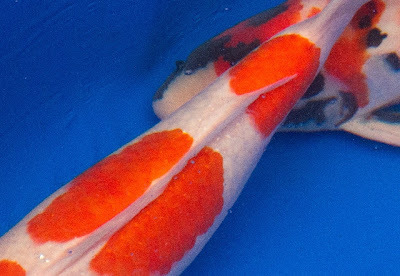 Club members final comments to me as they were leaving was.. let's organise another club visit to a koi show soon.